The CNDO (Chinese navy Design office) organizes a design contest for a light cruiser. The chairman of the board of the CNDO Cheung hopes for numerous applications. Perhaps also the construction contract is assigned to the winner, since the Chinese shipyards are perfectly overloaded. The United Kingdom is pleased to be able to offer the following design. Despite being two-thirds the suggested displacement, and having a narrow hull for her type, the ship has required rather more power than desired. We would suggest that this requirement be modified. However, as well as being significantly smaller than required, the ship requires fewer crew, and meets the standard of protection requested. We hope this proposal meets with your approval. (I assume that this is based on the historical Japanese-type "cruisers" the Chinese acquired? 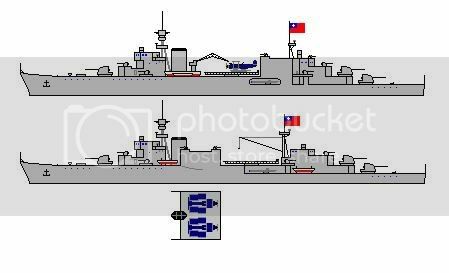 India will submit a design in the next few days; in the mean time, India also invites China to examine the refitted Kolkata class-cruisers (see the Indian Encyclopedia). Two units, modernized in 1927, are due for deletion from Indian service in 1933-34. These may suit Chinese operational requirements, and would be less expensive than new construction. She meets all specifications for armament, speed, range, and protection. Her entire waterline is armored, and her upper belt protects entire fighting compartment. Includes armored deck as well. Main and antiaircraft guns have ammunition hoists, for high sustained firing rates. Large ammunition supply. Excellent seakeeping and steadiness for gunnery. Will fit in a Class 1 drydock, reducing infrastructure expense. Our design team that it was not difficult to meet the specifications provided in this tender; rather than limit ourselves to the specifications, we chose to exceed them (within reason) where possible. We did, however, have to adjust the hull dimensions in order to provide what we thought was a minimum amount of hull space for the intended hardware. It is, as the design sketches indicate, still a tight fit. We have included two alternate sketches in which the main difference is juxtaposing the hanger and catapult, though some further differences will be noted. Armament is as specified. We have added twin mounts for our 35 mm cannons, which are useful in both anti-aircraft and anti-torpedo boat roles. These could be replaced in Chinese service with similar weapons such as the 40 mm or 37 mm. Note that India does not produce 14 and 7.6 cm guns, so these weapons would have to be either supplied by China or sub-contracted out. Armor is above specification. The upper belt exists to protect the hanger and aviation fuel storage from light weapons fire, lest this combustible area be ignited in combat. The aircraft suite is as specified. It is necessary in the one version of the design to flare the upper hull slightly in order to accommodate a hanger wide enough for two aircraft (a crude top view is included to show the fit). One catapult and one or two cranes are provided, depending on the layout. India’s Dhairya-type scouts are illustrated. Bunkerage and propulsion are above specification; however, this is with an all-oil bunkerage. A reduction in range and speed - both currently above specification - should allow for inclusion of coal bunkers. -35 t for growth or addition of coal bunkerage. We have not provided for anti-submarine or mine-laying equipment, judging that these missions will be outside the vessel’s role; lack of available deck space is also a factor. India would be capable of laying down two such vessels at its shipyard in Sittwe, in the first and third quarters of 1932. Additional units can be built at a similar rate in Chennai using either slipways or drydocks if required. Cost to the buyer would be 110% of the ship’s light displacement per unit, that being the cost of construction plus a 10% charge for use of the slipway. Purchase of exclusive rights to this design would cost a further 10% of the light displacement, on the first unit only. India is willing to negotiate terms of payment if required. Relative extent of belt armor, 85 percent of 'typical' coverage. The SAE welcomes Chinas effort to build up a small navy to limit the warlords access to the sea and support of pirates. The RSAN proposes a design slightly smaller than what was originally requested to save money. All requirements can be met with a ship cheaper and smaller which will not only help operations near the coast. Detailled conditions of the deal can be clarified later should our design find enough support among chinese officials. Rocky - I definitly like it (IMHO the first one, with the hangar aft, looks better). The Mexican entry. As you can see she has plenty of potential to be upgraded. She is based on the Mexican Alvaro Obregon Gunboat. Updated Mexican Entry. While meeting all the reqirements she is half the size, which means China can build 2 for 1 of this ship. She also has room for improvement if China so desires. It's a smaller design, but I'm skeptical that - despite what the report says - that you can fit that armament, a two-aircraft hanger, and a catapult on a hull shorter than a destroyer. SpringSharp doesn't necessarily deal well with slower (for their date) vessels, that's been noticed before. Ahhh!!! I knew I forgot something. I know it can at least fit one aircraft and catapult and maybe stuff another one in there, but I totaly forgot about the hangar. The chairman of the board of the CNDO Cheung said, a provided design for the delivered draft would naturally facilitate the decision. But it is neither an advantage still another disadvantage whether now a design is submitted or not. These ships are due for replacement under Treaty rules and are in reasonable condition. Speed and armor are in excess to the requirements specified. China thanks for the suggestion of Atlantis. We will contact you directly concerning the purchase. Independently of it the advertisement goes into the last phase, i.e. it ends on weekend. This entry does not meet certain criteria (armament, armor) laid out, and is submitted for as an intellectual exercise - though if China is interested, we can certainly talk business. This design is more of a large destroyer. Two dual 14 cm deck mounts are mounted aft; one is mounted forward, with the quadruple 1.5 cm "buzzsaw" mounted in the B position. 3.5 cm guns in dual mounts on the sides. A single floatplane on a catapult is carried; rather than install a heavy hanger, a collapsable canvas hanger is installed (akin to that on India's Nanda Devi class frigate). 20 t is allocated for ASDIC (10 t) and depth charges (~30) on rails. No depth charge throwers are included. Much better than the earlier Indian designs. She looks far less top heavy than the previous 2 ships. Not sure about the folding canvas hangar though, it might not really be worth the effort when tarps can be tied down over the engine and cockpit.